So how much revenue do you want to generate? And how does that translate to a number you can track so that you know you're on the right track? That's a metric. A number that measures your progress. Knowing that number allows you to gauge whether or not you need to do more work, or have done plenty. The alternative is to let your bookkeeper tell you at the end of the year, or your bank account at the end of the month. But that gives you the information when it's too late to do anything about it. Why weekly? Because a year is too big. And months vary too much. In absolute number of days. But more because of the holidays and the time you take off. NB: I'm not saying money is the end goal of your work. I'm saying it's a part of it you want to have taken care of. Neither do I think it should be the first thing you think about when doing business. But by tracking it, my aim is that you worry less about it. So, what is your number? What do you measure to know you're financially on the right track? That all depends on your financial ambition and your business model. Let me explain by way of 3 examples. An illustrator selling prints on a webshop. A painter selling custom 1-of-a-kind paintings. To keep things simple, let's say that all three want to earn €2.250 net income per month and thus need to make €40.000 in revenue in a year. This has taxes covered, includes 20% for rainy-day-savings and pension, and gives €500 a month for fixed costs. Plus, the illustrator and the painter have direct costs for production and selling that they need to make back on top of that. She is a freelancer, she gets paid when she works. While a year consists of 52 weeks, she smartly takes into account that she also wants to take time off for vacation or holidays. And she'll sometimes be ill or unable to work. That leaves only 44 weeks to work. To budget on the safe side and to allow for profit, she calculates with 40 weeks. So, on average she wants to make €1.000 a week. The product she offers is writing the about pages of companies, product descriptions in words that stand out and social media posts etc. She gets paid by the hours she puts in. This is similar for consultants, designers, coaches and lawyers. On average, she charges €75 an hour (excl. VAT). So, on average, she needs to bill 14 hours per week at that rate, for 40 weeks a year. Sometimes there are busy weeks, sometimes it's quiet. Some clients pay her less. At some of her newer clients, she gets to charge a higher fee. As long as it averages out to 14 times €75 per week she's doing great. This illustrator sells prints of his work online. The calculation structure of this example is the same for a photographer, a sketch artist or jewelry maker that sell standardised versions of their work online. Every print costs €5 to print, ship and handle payment. He sells them online directly to consumers for €36. Take out the VAT, that is €30 a piece. Of that, he makes €25. So, he wants to sell 1.600 prints in a year. Even though, he, just as the copywriter, budgets that he'll work for 40 weeks a year, the webshop keeps humming along when he takes a vacation. Although, let's say, it sells twice as much in the weeks when he's actively working on it. In the weeks he works he sells 35 a week. In the weeks he is off, he sells 17 a week. That's 40 weeks of 35 -> 1.400 prints. And 12 weeks of 17 -> 204. That's 1.600 prints, resulting in €48.000. Which is €40.000 when we deduct the direct costs. If he would sell digital copies of his pictures, an ebook or music albums, the shipping and production costs per additional unit would drop. If he'd sell just as much, he'd only have to charge €25 (excl. VAT). Or maybe he could sell 10 times as much if he halves the price. I'm not saying what's smart, I'm illustrating the method. 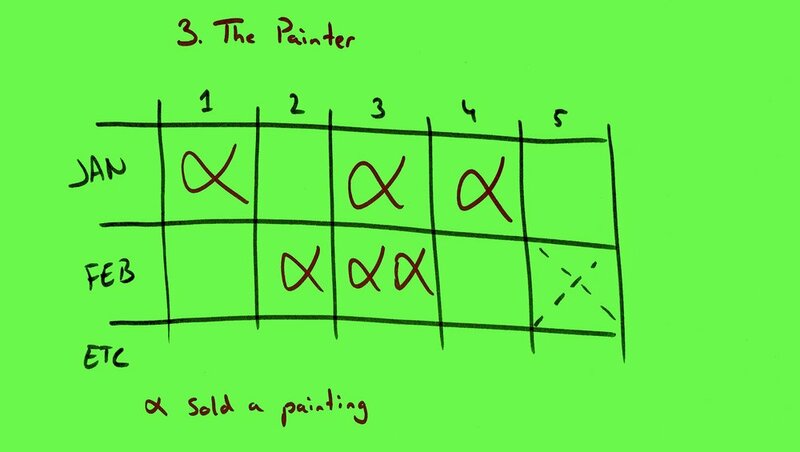 The painter's model is similar to the freelance copywriter in the sense that they are both freelancers getting paid when they work. However, the painter's clients see her work much more as a product and don't think in 'hours spend on creating it'. This is similar for someone who makes custom furniture, a jeweler who makes custom wedding rings, or a trainer/speaker doing a gig. Yes, it's clearly taken time to do it, but it takes a little mental jump for the client to see it. Just like the previous examples, she works 40 weeks a year. Her material and shipping costs are €250 per painting (they're big). She generally sells them for €2.250 (incl. the €250 costs for materials and shipping and excl. VAT). That means she needs to sell, paint and deliver a painting once every two weeks. Or, if she sells them for €225 (incl. €25 for material and delivery), she needs to sell 5 a week. You get the idea. With these examples, I hope you can calculate what's applicable to you. Maybe you have higher or lower revenue goals, calculate based on those. Or maybe your work consists of a combination of freelance and productised work. Or a combination of high-end custom work and low-end production work. Then split up your revenue and time into two streams and do the math. Well, that's the game part of it. To find a way to sell the amount for the price you want/need. And to win bonus points, to set up your sales system in a way you like doing it. That sales system, and determining what and how much work goes into generating that revenue is a topic for a next blog post. I hope this helps determine a number that you can track and that that will give you peace of mind. When you liked this, I would love it if you would like or share it. It really helps new people find my work. Plus, if you liked this or when you feel you need more of this, maybe my upcoming private masterclass Strategy: Business Models & Pricing is exactly what you need!